Can Composites Be a Game Changer for Utilities? Over the last decade, Strongwell’s COMPOSOLITE® Secondary Containment System has been the method of choice for oil containment systems for AEP (American Electric Power). The fabricated system utilizes COMPOSOLITE® structural panels and EXTREN® square tubes, angles and plates. As a result, AEP maintains compliance with the Environmental Protection Agency’s Spill Prevention Control Countermeasure Regulations (40 CFR Part 112). The mandate dictates that utilities must take steps to prevent the “reasonable potential” of an oil spill reaching navigable water. Prior to Strongwell’s system, AEP used pour-in-place concrete containment systems around its oil-filled substation equipment. Concrete is labor intensive and dependent upon location and temperature restrictions. AEP also tried berm dikes, but associated equipment access and maintenance proved to be difficult. 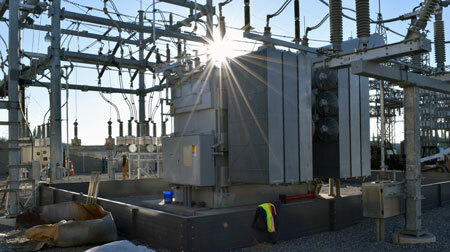 Recently, Strongwell and C.I.Agent Solutions® collaborated with AEP on a substation in Blacksburg, Virginia which used C.I. Agent’s Oil Filtration Panel System coupled with an AEP liner. The installer, Service Electric Co. was able to complete the job despite frigid temperatures. Team members complimented on the ease and simplicity of this particular installation, as it this was their first interaction with a composite secondary containment system. The provider of the barrier boom, C.I.Agent Solutions®, has installed over 10,000 SPCC Compliant Secondary Containment Solutions Systems and developed a completely customizable containment drainage system utilizing Strongwell’s COMPOSOLITE® Secondary Containment System coupled with their C.I.Agent Solutions® Geomembrane Liner Floor and C.I.Agent Solutions® HFF Oil Stop Valve. Each COMPOSOLITE® secondary containment system is corrosion and UV resistant, strong, low in thermal and electrical conductivity, cost effective, resistant to direct flame and easy to install. On typical installations, the COMPOSOLITE® system requires half the man hours of a concrete system and no special equipment is needed, resulting in significant job savings. The system is delivered in a kit form to job sites and includes drill bits, adhesive, adhesive applicator and fasteners.